As Gustav barrels toward and through Cuba, probably on its way to the New Orleans Gulf Coast, we should be praying for those in its path. This cat 3 hurricane with speeds of 120 mph (building to a category 5 with 155 mph winds) has already killed 78 people in the Caribbean. The landslides, floods and high winds resulting from this storm are deadly. Hanna is another storm out there rolling along. There are also two more tropical storms that are being tracked off the coast of Africa. Good times at the beach. Unless you live in an area that has been impacted by a hurricane, you can’t imagine the emotional impact of coming storms. People are on edge and rightfully so. By the way, we in Florida are not praying that the storms will turn away from us and hit someone else. 3 years ago, Katrina passed directly over us as a tropical depression and developed into the historic hurricane that wiped out New Orleans. While we are grateful for the protection, we don’t consider their loss as our gain. It is all pretty humbling. Plainly, I am praying that these storms fall apart or at least hit uninhabited areas. If they hit populated areas, I am praying for the storms to weaken. If the storms are powerful and hit developed areas, I am praying for God’s hand to protect life. God is in control. Let’s turn to Him for help. We got word tonight that David Lanier, a long-time friend and mentor passed away today. He and his wife Betty have been major influencers and supporters of ours for many years. The Laniers mean the world to Letha and I, they touched our lives deeply as we walked through the most difficult challenge we have ever faced. He pastored us through these challenges. 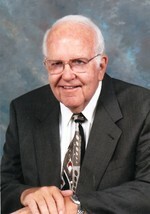 David Lanier was a great pastor and a true leader. Some things that he planted in my life will remain, including a heart for world missions. He took me on my first trip, to Moscow, Russia in 1992. He gave me advice, encouraged me and challenged me. At one critical point in the development of our ministry, he told me, “prepare, prepare, prepare” (for whatever doors God opens in the future). That advice stuck and I have repeated it many times. Our deceased daughter, Jenna, called David Lanier “Big Pastor”. And he was. He was big physically, big in character and big in influence. Big Pastor will be missed. I think “uttermost” says is better. Just something direct about it, it leaves no question. When describing the level to which Christ saves us, I think that being thorough is important. Uttermost. That says it. This scripture comes after Joshua died. I think it is interesting to see how the impact of one man runs deep and lasts beyond his years. Throughout his lifetime and throughout the lifetimes of the men who worked with him, the people under their influence followed God. Joshua’s legacy of serving God lived on. An important note is that these people had a personal experience. They saw with their own eyes what God had done. Being a great leader, Joshua led the people into a personal encounter. And that encounter outlived the leader. This is a motivating thought for me. If we do it right, we can influence others long after we are gone. Let’s be sure that our motive is to influence people toward God. Let’s experience God first-hand and influence others to do the same. This was one of the more productive and satisfying weekends of ministry for us in recent memory. We had a blast at the Fusion Conference in Clearwater. We received a lot of affirmation from the people there, apparently what I shared made a difference. We also enjoyed some great breakout sessions and I gained some real perspective on several important issues from some pastor-friends. We made a few new friends as well. The ministry at Maranatha on Sunday was beneficial. I dealt with a pretty tough topic in our current The (not so) Perfect Family series. It is great to be in a ministry culture where the truth can be shared and there is a spirit of openness to the teaching. Maranatha is a great church family and God is doing some awesome things among us. I hope your weekend was great. I am posting this early in the evening with the hopes of some R and R tonight. The Fusion Conference is going very well. I had the chance to present at a session this evening and it felt like I connected with the people who were there. Below are a few of the things I mentioned as I spoke about Risk in Ministry. An encouragement to wise risk-taking. What is the price? What potentially could happen? Who could get hurt? What is the personal cost? Theological : questions of doctrine. What is the toughest ministry decision you have made? What was the toll , the cost of the decision? Are there people who have yet to recover? That’s what we mean by risk. There are a few short cuts: education, mentoring, coaching. But there really is no substitute for experience. Sometimes youth and inexperience gets us into trouble. We are full of vision and passion and energy. And sometimes we are full of arrogance. And sometimes we have a tendency to discount the wisdom of others, especially is they are older (not cool). I Kings 12:12 Rehoboam refusing to listen to older counselors, those of his father Solomon. He listened instead to “the young men who had grown up with him.” It got him into deep trouble. There is wisdom in a multitude of counselors, not only those who agree with you. If all of your advisors agree with you, you need new advisors. Unless the building is on fire, wait a minute. Make sure you have the credibility and trust of the followers prior to making a big change. The “24 hours rule” for sending emails and letters. (John Maxwell) this take lots of time. Focus groups work well. Let people talk through it. again and again (not necessarily a big fancy mission statement repeated until people are sick of it) but what God has called you and the church to do. Say as often as you can in as many ways as you can. Specifically: what unique thing has God called you to do for Him? of the vision to the essential core values of the organization. 7. Commit to see it through. If you bring about change in an organization, stay around to help fulfill the change. This weekend, we are at the Fusion Conference in Clearwater, Florida. It is a meeting designed for pastors and spouses 40 years old and younger. You don’t have to remind me that I do not belong at this conference. I am not so old that I have forgotten my age. I have been invited to help out with the meetings and to speak at a session. I am really looking forward to the opportunity. The topic I am addressing is Risk Management in Ministry. My head is full of stuff that I would like to say, but I am in the process of weeding out everything except what God wants me to say. If you read this before Friday night at 8:30 Eastern (when my session starts), I would appreciate a prayer or two on our behalf. I’ll do my best to post late tomorrow night on how it went and hopefully include a picture of the group.